The Australasian Railway Association has released a report showing that, based on international construction costs of $35m/km, a high speed rail line from Brisbane to Melbourne could be built for $63bn. This is significantly less than the $114bn in the Australian Government’s recent high speed rail study. An initial list of 10 possible light rail lines from Parramatta has been cut down to 4, with a final decision to be made in the near future. The government is set to pick a line connecting Parramatta to either Castle Hill, Macquarie Park, Olympic Park, or Bankstown. The indexation of the fuel excise is to be introduced by the Australian Government despite the Senate having blocked legislation to enable it. Reintroducing indexation will cause the price of petrol to rise by about 1c per year and is expected to raise $2.2bn over 4 years. The move is expected to put pressure on Senators to pass the measure so that the additional revenue raised does not have to be refunded to petrol companies. The Government is calling on app developers to help create a series of apps that will meet the needs of people with a disability using public transport. This is aimed at ensuring compliance with the Disability Discrimination Act to provide better services for people with a disability. “Planning a journey, knowing that our stop is coming up next or even knowing which side of the train to alight from are tasks that most of us take for granted,” a Transport for NSW spokesman said, adding that “for customers with disability or impairment it can be a huge cause of anxiety”. Selected app proposals will receive seed funding, ongoing access to real time transport data as well as promotion of their product by Transport for NSW. A Gold Opal card for seniors and pensioners is to be released on Monday 3 November. The card will feature a $2.50 daily cap and also offer free travel after the first 8 journeys each week. Speaking about existing paper tickets for seniors and pensioners, the Transport Minister Gladys Berejiklian said that “the paper Pensioner Excursion Ticket will continue to be available on Monday November 3, and well into the future”. Gold Opal cards can only be obtained online or over the phone. An additional 50,000 homes will be built along Parramatta Road over the coming decades, with over two thirds of homes slated for the Western end of these Parramatta Road between Granville and Strathfield. 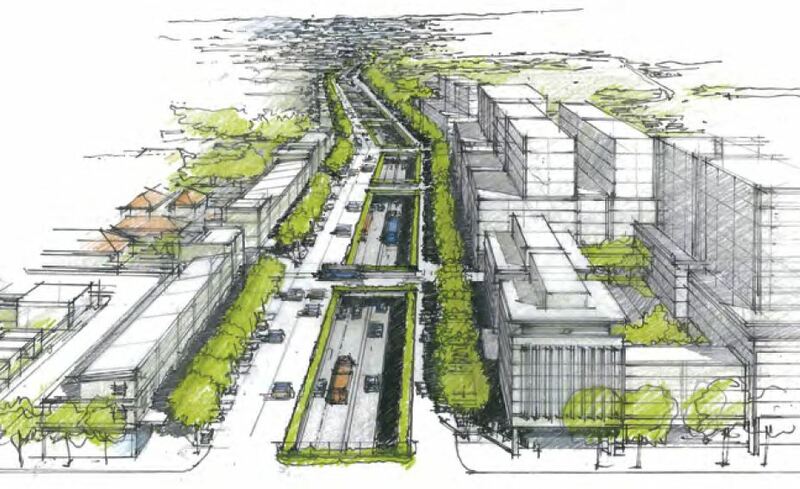 The NSW Government is planning to widen the M4 alongside this portion of Parramatta Road while building the M4 East Tunnel underneath the Eastern portion of Parramatta Road as part of its WestConnex project. The terminus station on the North West Rail Link (NWRL) could be named Whitlam, after Blacktown City Council proposed naming a new suburb after the former Prime Minister. The station is currently known as Cudgegong Road. Infrastructure NSW released its 20 year infrastructure strategy, titled First Things First. Most of it was dedicated to transport, which I will be focusing on, though there were also sections on energy, education, water, etc. The recommendations of the report were summarised in this video below, which is a good 4 minute version of the 200+ page report. The report agreed with some recommendations of the Transport Master Plan, but disagreed with others. And these weren’t just alternate views, it actually took the time to highlight its points of disagreement and explain why it disagreed with Transport for NSW. The Infrastructure NSW report feels very much like it comes from Treasury, and has what I would classify as a pro-road and anti-rail bias. Even when discussing public transport, the report almost universally discounts rail projects in favour of a bus one. But I’ll save those comments for a later post. For now, I’m just going to focus on some of the things that I thought were good about this report. No one likes being the fun police, and when it comes to funding that means being the department that tells you that you can’t afford something. This report does that well, which you could argue that the Transport Master Plan did not. While the Master Plan was a bit of a wish list, this report did a good job of emphasising the limited nature of funding available and promoted projects which it believed give most bang for the government’s buck. Building entirely new projects – another road or a new rail line – is incredibly expensive. Maximising use of existing infrastructure, on the other hand, does not give the impression to the voters that you are doing much to improve the situation much, but is actually a very effective way of increasing overall capacity. 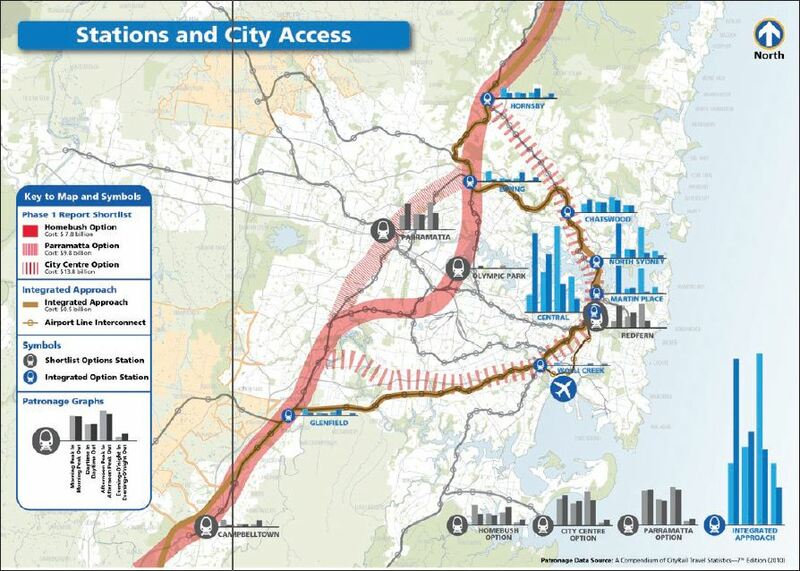 The Clearways project for Cityrail is a great example, which has helped to increase rail capacity via track amplifications, more turnback platforms and additional stabling yards, none of which make the headlines quite like a new rail line or freeway do, but have increased rail capacity by similar amounts for a fraction of the cost. Time of day tolling on the Harbour Bridge/Tunnel is another example, which used pricing to encourage some people to drive during off peak hours (as you only need a small change in traffic to provide a big improvement in congestion). Infrastructure NSW is encouraging further use of time of day tolling on the remainder of the road network in order to improve efficient use of Sydney’s freeways. In regards to public transport, it looks at ways that portions of the rail network that are currently under utilised, such as the City Circle, can be better used. It also proposed that off peak travel on public transport be given deeper discounts once Opal is rolled out in order to encourage more off-peak travel where possible, rather than peak hour travel. Where possible, the report has attempted to minimise how much funding the government itself will have to contribute to projects, usually by emphasising private toll roads. The WestConnex (a combination of the M4 East, M5 East, and the Inner West Bypass), for example, has a price tag of $10bn, of which $7.5bn is expected to be paid by the private sector. A cheaper way of building the M4 East, by digging up Parramatta Road itself, rather than a very expensive tunnel, to bring down the cost was also welcomed. The M2-F3 link would be built if a current private sector proposal to build it entirely with private money were to go ahead. These are achieved through a user pays system, in some cases with some government funding where necessary. But if the government can get new infrastructure built for free, paid for by the user, rather than the taxpayer, then it should get as many of these projects built as possible. 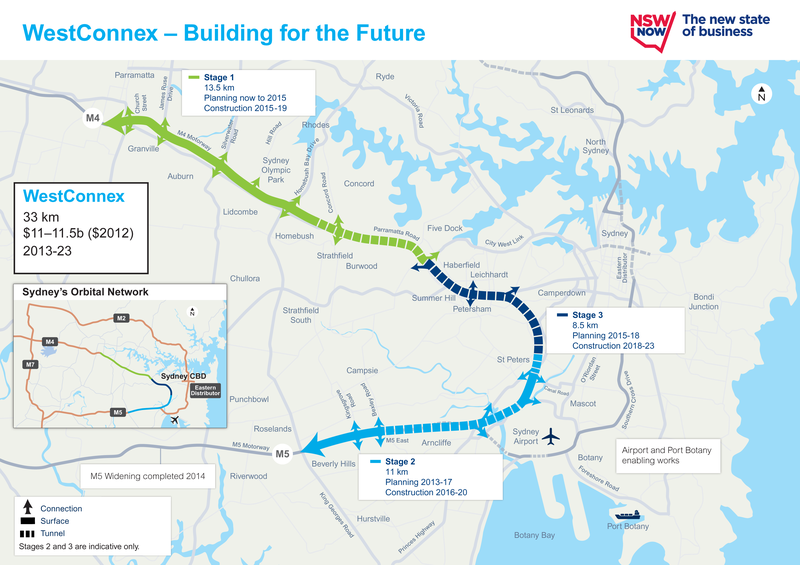 The report recommends a new airport be built in Badgerys Creek. Right now this is at odds with the O’Farrell Government, which opposes any second airport in the Sydney basin, and also the federal Liberal and Labor Parties, which support a second airport at Wilton, which is a less optimal site than Badgerys Creek is. Both regional rail links and high speed rail are played down by the report. Both are on the expensive ends of the scale, with limited benefits. 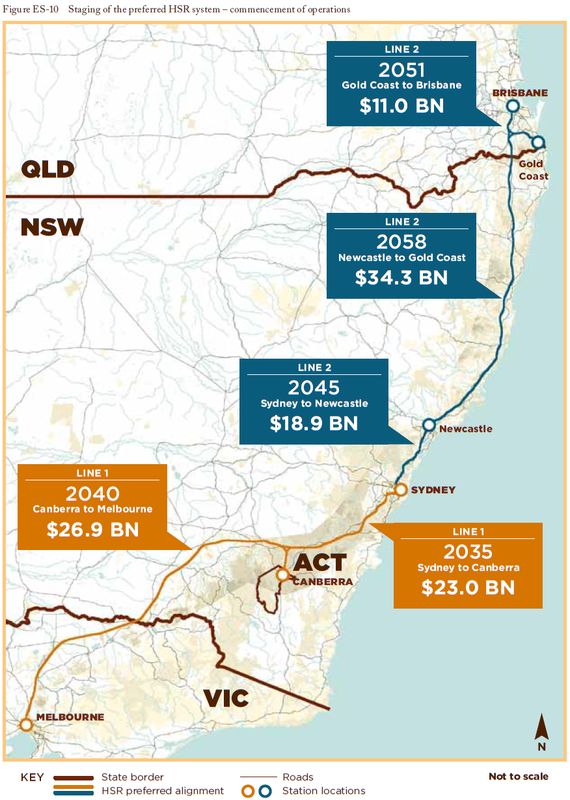 Many XPT routes in regional NSW would probably be better served by buses, which would allow better connections with the limited budget, while high speed rail is just too expensive with its $60bn-$108bn price tag for the improved connectivity that it would provide. 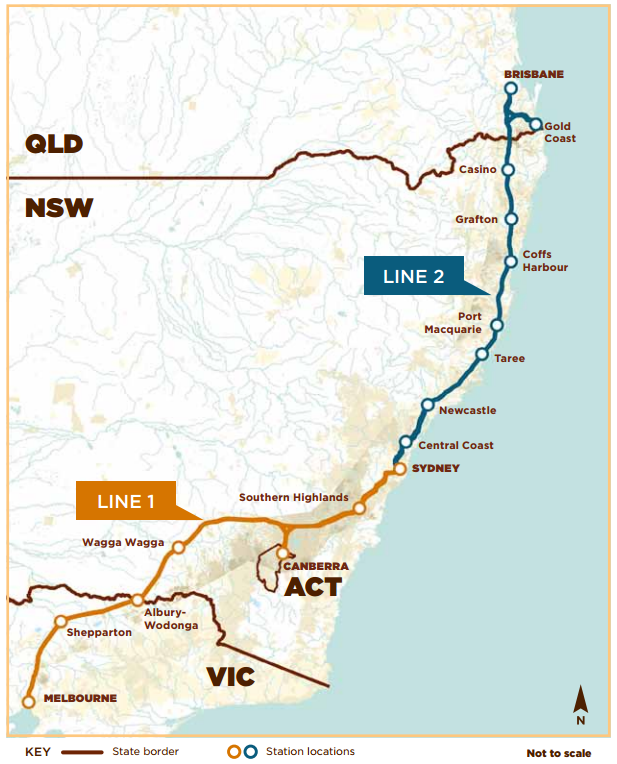 The report calls for an improvement in rail lines to allow for an average 80km/hour link to both Gosford on the Central Coast and Wollongong, which would put them within 1 hour of the Sydney CBD. That trip currently takes 60km/hour on rail. Improvements like this are incremental and affordable, and are what would be required if high speed rail is eventually to be introduced to Australia’s East Coast. A quarter of a century ago, the federal Labor government decided to build a second airport in Sydney at Badgerys Creek. It spent the next few years acquiring land there. However, the Liberal Part was opposed to the Badgerys Creek location and when the Howard Liberal government was elected in 1996, this policy was scrapped. Later, Labor under Simon Crean also dropped its support for Badgerys Creek in the early 00s. The federal government still owns the land at Badgerys Creek, but both parties officially oppose a new airport there. Last month, a joint NSW-Federal report was released recommending Badgeries Creek as the preferred site for a second airport in Sydney, with Wilton as the next best option. Instantly, the parties repeated their positions. Federal Transport and Infrastructure Minister Anthony Albanese of the Labor Party said his preferred location was Wilton. Meanwhile NSW Premier Barry O’Farrell of the Liberal Party said he wanted no new airports in the Sydney basin at all, preferring instead to build a high speed rail link to an upgraded Canberra Airport. Mr O’Farrell’s proposal to use Canberra Airport has been dismissed by Federal Liberal Shadow Treasurer Joe Hockey who also wants an airport built at Wilton. No one wants an airport in their backyard, it’s simple NIMBYism (Not In My Back Yard). What is strange is that Mr O’Farrell has adopted a more extreme version of NIMBYism, something fellow Liberal, and Federal Opposition Leader, Tony Abbot called BANANA: Build Absolutely Nothing Anywhere Near Anyone. Every year, more and more people move into areas that could hold a second airport, and the longer the wait before action is taken the larger the voter backlash will be. The reality is that Sydney’s Kingsford-Smith Airport will reach capacity by 2027 according to the joint report, or 2045 according to the company that operates Kingsford-Smith Airport. The clock is ticking, and inaction is no longer an option. Lenore Taylor wrote the best piece I’ve read on this issue, for anyone looking for additional reading on it.